It’s a good thing that the airport is relatively convenient. I have just spent a week in Mackay and then a day in Mittagong. It was a wonderful week in Mackay. I went there to talk weaving, dyeing and to spent time walking on the beach and in the rainforest with my friend Helen. Helen has a 4 shaft loom and wanted to investigate “holes” and textural fabrics, so we worked with overtwist wools, wool/lycra and her stash on a lace weave structure. I got this very excited email this week. The scarf turned out just as you said it would and looks great. The overtwist worked better on lengthier parts than shorter parts. So the small piece I have decided to turn into a U shape, pick up the edge and knit into the middle calling it “Captured”. Then I started to experiment with knitting with the overtwist – wow – what an experience. The overtwist wool looks delicate but the wool lycra worked on very large needles just goes nuts and sends the yarn around it into contortions – why haven’t I discovered all this before, it is great. I am looking forward to seeing how Helen will incorporate this into both her weaving and knitting. 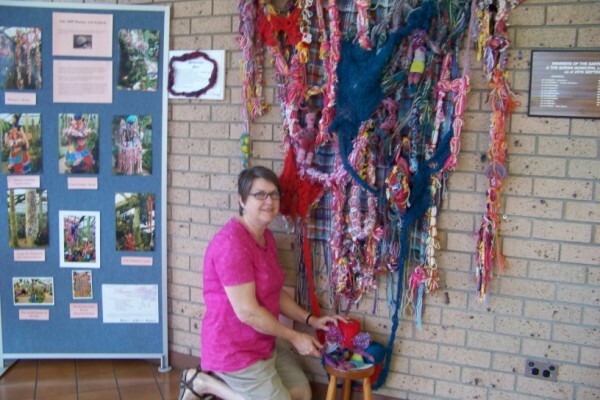 Helen enjoys doing wall pieces that combine weaving and knitting. We installed this piece in the Sarina Library. 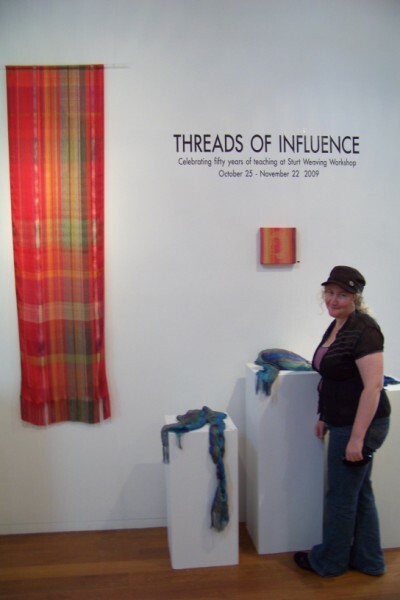 Then when I got home from there, I also couldn’t resist going down to Mittagong and having a look at an exhibition, Threads of Influence. Yes, one does have to be a bit crazy to go all that distance in one day, but I did really want to go. A flight and a car hire is all it takes. 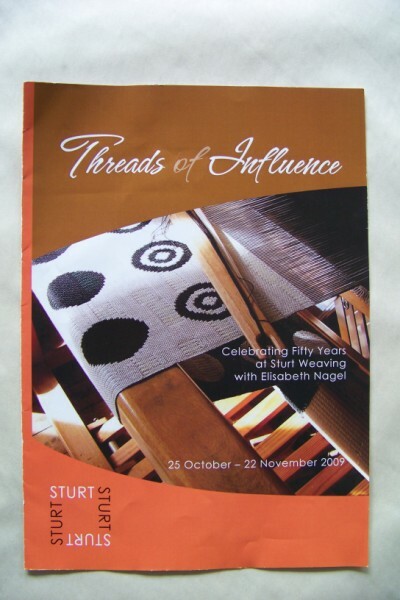 Elisabeth Nagel has been weaving and teaching at Sturt for 50 years and this exhibition celebrates that achievement. 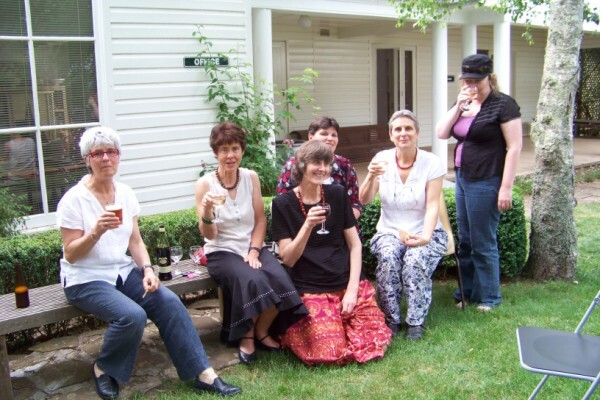 Other weavers who had also taught at Sturt were invited. The exhibiting weavers were Elisabeth Nagel, Jeannine Binoth, Julie Monro-Allison, Melanie Olde, Monique Van Nieuwland, Liz Williamson and myself. It was a very diverse exhibition. The invitation for the exhibition with a detail of my work on the loom on the cover. This is one wall of the gallery showing work by Elisabeth Nagel, Liz Williamson and myself. 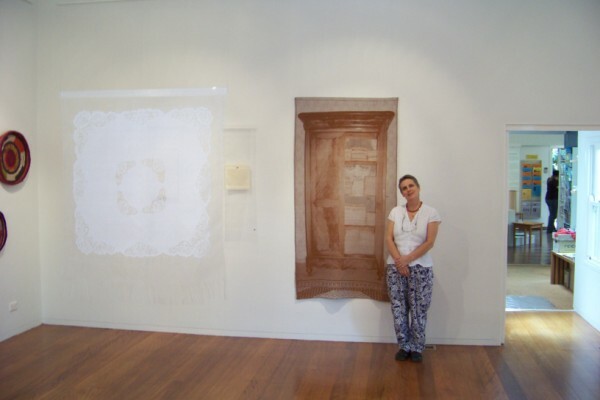 Melanie Olde in front of her work. Monique in front of her work. As well as seeing the exhibition it was great to catch up with the friend that I had made during the residency. It was also amazing to see what Sturt looks like in summer. It was very lush and green. We celebrated the end of the day with wine and cheese on the lawn. It was delightful: late afternoon, a cooler end to the day, drinks and chesse on the lawn, and relaxed conversation. How different it looks now. 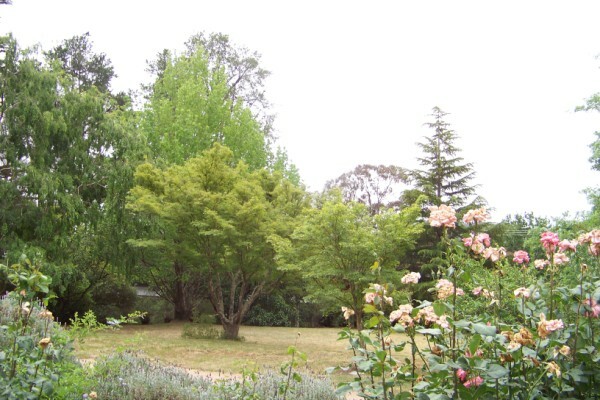 For those who followed the blog from my resisdency at Sturt I often included pictures of the gardens including this pathway to the studio. The grounds were so lush and green. 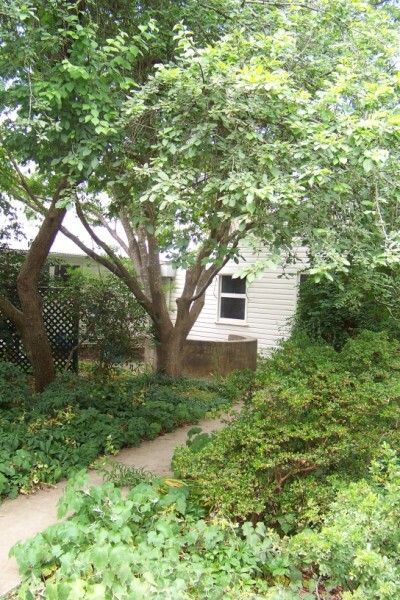 When I was artist in residency, I use to always start my blog with a picture of the view from the front of the studio. It seemed appropriate to finish this update with the same view. I have decided to continue this blog that I began at Sturt. I have had such fabulous feedback on it, so I’ve decided that I’d like to continue to share my adventures and musings. 9.9.09 What magical numbers they are! I left home on that day and arrived in the USA on the same day flying onto Reno. Early morning in Virginia City. The sun is just shining up the valley. The shadows are long. The heat of the day is yet to begin and the day is quiet. Look at how the town fits in amongst the tailing mountains. There may be wild horses. First stop: Reno where I finally got to meet Suzanne. We had been in contact for a number of years so it was great to finally meet. After a day or so to recover and collecting provisions, we went to Virginia City for the first of the workshops. I was fascinated by the history of the area. Crossing this area in the early settlement days with wagons over this very harsh high mountain dessert was an amazing feat. Then came the miners creating a tent city with their search for silver. There’s no city here now though. Impressions include the amazing harsh landscape, buildings in amongst the tailings, the most amazing clear blue sky and early morning sun coming up the valley. It was an inspiring spot to hold a weaving workshop. Great results were achieved. Those ladies worked from early till late at night, achieving an impressive quantity of samples. This is the moment when all is revealled. What fun! Next stop: Atlanta. What a contrast: from hot and dry to wet, wet, wet! I arrived in the middle of flooding. Again I was there to teach. A visit to Swan House provided a day for recovery out of the rain before I started work. The curtains there have the most amazing variety of trims. Again both classes produced an impressive quantity of work. It is amazing how diverse a range of samples can be achieved because of the direction and interest of the individuals in each group. Between the workshops, my hostess and friend Judith and I had a day of play in the studio. We did some experimental dying, but more will appear of this at a much later date. Needless to say we had fun! The first Atlanta class with their amazing collection of samples. Work produced in just 3 days by the second class. What variety! Put the two group’s samples together and what a real mixture there is. And no, one group didn’t produce “more” or “better” than the other in spite of how many times I was quizzed on which group was better… They were just different and the work equally full of potential. North to Waynesville and my stay with Catharine Ellis and husband Kent was next on the itinerary. It was great to be able to spend some time with them as our friendship has developed over many years through a mutual interest and the development of loom controlled shibori/woven shibori resist. Fall had started. I drove along the Blue Ridge Parkway in an open topped sports car watching the leaves starting to fall. I also got to see Biltmore House. This was an amazing visit. Both Catharine and I had been to France for the International Shibori Conference last year. On that trip we had visited Prelle, a weaving mill in Lyon. They had the most amazing resource of records from their past clients including what was woven, and all the dye recipes and weaving details for each client. I was excited at the time because they were weaving velvet, one of my areas of interest, while Catharine was excited because they were weaving a commission for Biltmore House, just down the road from her. Imagine our delight when we came into the room and saw that velvet which we had seen being woven in Prelle installed! There were treasures inside: 3 rooms of the most exquisite velvet: drapes and bed coverings. WOW! What a shame we couldn’t take photos inside. From the traditional to contemporary. Blankets were being woven on a small privately owned jacquard mill in Asheville. Next stop: Philadelphia via Kati and John in Alpena, Northern Michigan. I was in a quandary: how to divide up time between Philadelphia, Washington DC and New York in a week? I think that I can safely say that I maximised my time: 3 days in Philadelphia with Bettes and Larry , 1 day in Washington DC ( Textile Museum and the Smithsonian complex), 3 days in New York. (Smithsonian National Museum of American Indians with a costume exhibition, Here are some visual highlights. Four artists used a collection of old laces and interpreted them in various ways for this exhibition at the Design Centre at the Philadelphia University: Lace in Translation. I particularly enjoyed this chain wire fence and a huge cut out metal cylinder. C15 velvet under glass in the Metropilitan Museum of Art, New York. There was an amazing collection of very beautiful velvets that I just happened to find. I had asked at the front desk if there were any textiles on display with “no” being given as a reply. I decided to go in anyway and see a collection of old masters. This is what I found instead! I had been hearing about this silk shawl ever since I had been in Atlanta. Reports on it were just surfacing and here I was in New York and able to see it. Woven from Golden Orb spiders silk in Madagascar it was surprisingly large and very yellow. The design was very complex with a mixture of supplementary warp and discontinuos weft pattern on tabby. The shawl had been woven in bands and joined. A surprising detail that seemed to be at odds with the detailed weaving and intricate fringe was that the fringe was very uneven. Possibly all the left over “silk” was used with not one iota wasted or trimmed off. Four of us collected in Philadelphia and drove north into the New England to Shellbourne Falls and Vavstuga. 8 of us had the most wonderful week of exploring a variety of weave structures, with wonderful food such beautiful surroundings. I got to experience Fall and I even had a bit of snow one morning. My friends were not impressed by snow and I wanted more. They thought that it was way too soon to be starting winter. In 5 days we had put on 10 warps and woven on most and that was just till 9.00 at night. When we were evicted from the studio, we progressed upstairs where we were exploring Laos looms under the guidance of Deb McClintock, an expert on the technique. We were all excited by the similarities of what could be achieved by those “primitive” looms and double harnesses on Swedish looms. The fun never stopped. Late night activity: How to weave supplementary complex weft pattern on a “Laos” loom. There’s more than one way to achieve the same goal! This is the view from the room where we had meals. It was surely an effort not to “hog” the view every meal time. I am entranced by the Fall colours! For the last week, I went north to Ontario. On the way we were fortunate to have an appointment to see the collection in the American Handweaving Museum at Clayton. 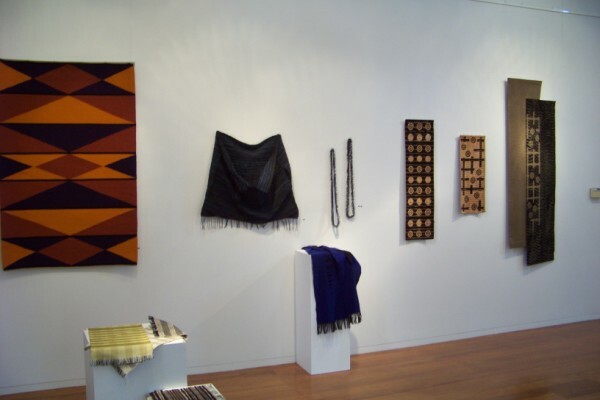 It has an amazing collection of the work by weaving pioneers including Bertha Frey, Lucille Landis, Mary Snyder and Theo Morman . What I found delightful was the transparency of this work. I had been familiar with a denser background for this technique. It was a treat to see a real piece of Theo Morman’s work. On the way north, we also stopped off to do a usual “must see” visit to the Textile Museum in Toronto on the way up to Barrie. How did I fill in that final week? I played in the studio of my friend Jette and visited the ROM. They have a very wonderful textile section where you can get to pull out drawers and admire old textiles, including velvet. The week flew and it was time to head back to Australia, arriving home on 28th October. Did anyone count photos? Well I did it: 14 photos! You are currently browsing the Kay Faulkner's Blog blog archives for November, 2009.